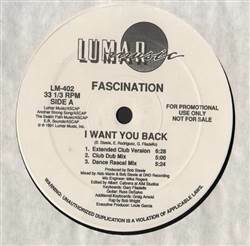 Fascination - I Want You Back 12"
FREESTYLE, Lumar, USA, 1991... I Want You Back (Extended Club Version), I Want You Back (Club Dub Mix), I Want You Back (Dance Rascal Mix), I Want You Back (House Mix), I Want You Back (House Dub), I Want You Back (Radio Version). Miranda - Round & Round 12" Sweet Sensation - Sincerely Yours 12" Dawn Deegan - We Can Have It All 12" India - The Lover Who Rocks You (All Night) 12"